Fascinated by Farley Mowat’s books and the land he writes about, Leanne Allison and Karsten Heuer take their 2-year-old son and dog on a wilderness canoe expedition to trace the routes of Mowat’s travels and to visit the landscapes in which he lived and wrote about in Born Naked, Owls in the Family, Never Cry Wolf, People of the Deer, The Boat Who Wouldn’t Float and A Whale for the Killing. Their 5000 kilometre trip begins in Calgary Alberta, takes them east and north to the shore of Hudson Bay and then south and east again to the Martimes to meet Mowat at his summer home in Nova Scotia. Paddling and portaging their canoe, driving a hastily (and cheaply) purchased van, traveling on a train and sailing on a homebuilt sailboat, they encounter many of the animals that Mowat featured in his books and suffer the same challenges of wilderness travel. 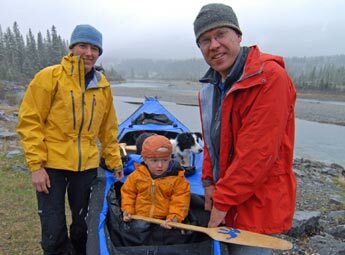 Despite hardships (bugs and wet feet, for example), the small family feels a deep connection with the land and with Mowat’s writing, rereading his books and corresponding with him during the trip. This isn’t a fast-paced and exciting account of adventure, but more a retrospective and thoughtful account of the experiences and reflections of the family’s experience. At 62 minutes, I suspect it may not hold the interest of all younger audiences, but certainly will be of interest to Farley Mowat fans and wilderness adventurers among older students and teachers.